Just 16 kilometres to the north of bustling Buenos Aires lies a small town full of life but at a much slower pace. Tigre sits at the mouth of the Delta and sprawls out from a grand riverway to a web like maze of smaller rivers and streams. Serviced by two train lines, the Mitre and la Tren de la Costa, along with several bus routes, it is easily accessible for tourists, along with a great weekend day trip for locals. Starting from the Maipu Station in the Olivos barrio of Buenos Aires, I hopped on the Tren de la Costa for the short ride to Tigre. This particular train route allows you the option of stopping to explore any or all of the costal communities along the way, then you hop back on the next train (approximately every 30 minutes). 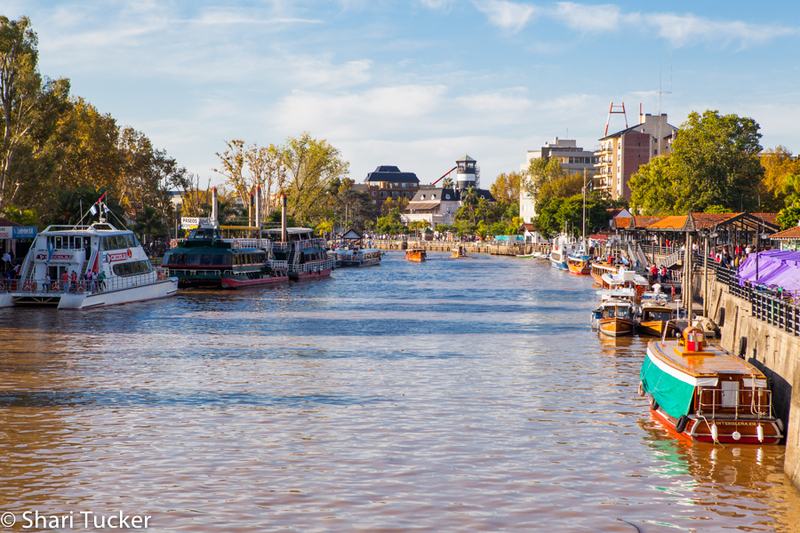 I made one stop at Barrancas and then continued on my way to explore Tigre. At the Tren de la Costa station in Tigre you are met on the platform by a small market with a handful of local vendors and then more vendors line the streets to your right. Also on the right you’ll get your first glimpse of the amusement park. I headed left to find food as it was mid-afternoon and my tummy was asking for lunch. I was traveling with a friend and we grabbed a spot at one of the first parilla (barbecue) restaurants that we found called La Isla. A parilla for two, with five different types of meat, a salad and two drinks totalled up to nearly $400 pesos. Yikes! On the bright side, the chimichuri sauce was devine and we were stuffed when we left. I’m sure the next few hours of walking did us good! At this end of town, there isn’t a whole lot to see outside of the market and the amusement park. It was fun to watch the bungee jump-style ride from afar, but I didn’t feel the need to jump from a tower that day. We followed the flow of people up the road and around a bend until we saw the river bubbling along, teeming with boats and the river banks filled with families and friends relaxing in the sun. We walked up-river, dawdling along, people watching and checking out a few vendors along the way. I stopped to take a few photos, watch a bit of a busker show and poke through the market with the purple stalls. Then, we made our way to the bridge and crossed over to the other side of town. The river banks were clustered with families and friends have picnic lunches, couples kissing, dogs and children playing and the elderly sitting on nearby benches over looking the river. A few vendors provided snacks and tourist trinkets along the way, but never once did any of them approach us to sell their wares. They just served those who approached them. We walked to the bend in the river and followed the park-like path with even more people enjoying a lovely Sunday afternoon in the sun. It felt like one big picnic party, but I left my basket at home! Along the way I marvelled at the beautiful buildings on both sides of the river and enjoyed the late afternoon sun. After all, we hadn’t arrived in Tigre until about 2:30pm, had lunch and then wandered for an hour along the streets before heading toward the Museo de Arte Tigre. I had heard the the Museo de Arte Tigre was the most beautiful building in the city and it did not disappoint. Not only is it beautiful, but we timed it right to enjoy the late afternoon sun warming it’s outer walls with golden light. My only disappointment was that I didn’t have enough time to explore inside. We did, however, get to take in a beautiful dance performance. It may have been tied into an election speech, but with my intermediate Spanish, I didn’t really know what they were talking about. I was just happy to see the beautiful performances. We stayed around the Museo de Arte for about half an hour wandering the grounds and watching the performers before walking back the same direction in which we had arrived. After crossing the bridge, and my feet being sore, we decided to take the Mitre train line back to Buenos Aires. It was packed, but luckily I was able to hop on the train at the front of the line and nab us two seats rather than standing for the 20 – 30 minute ride back. The other benefit of this was that I was able to get off the train at the Belgrano station rather than heading all the way back to Maipu and needing to take an hour long bus or 1/2 hour taxi ride home. Overall, it was a beautiful day. I’ll likely do the trip again in my next few weeks here. If the weather stays warm enough I may head back to Peru beach for some water sports. And, if not, I think a trip to Tigre just to wander the Museo de Arte Tigre would be worth the 30 minute train ride.